The need for housing has increased significantly during the last decades all over the world. It is felt particularly in countries where the population growth rate is high and the economy is developing fast; but everywhere people are shifting from the countryside to towns, where housing in neighbourhoods often becomes critical. The need for affordable housing may concern high-rate urbanization, rural areas to be upgraded, workers’ settlements in remote regions, rebuilding dwellings destroyed by disasters such as earthquakes, floods or wars, and even holiday resorts and leisure dwellings. Large projects always face cost- and time-constraints. Local conditions may be variable with respect to the physical, social and economic environment. Thus, minimising cost and time of construction, while maximising quantity and quality of product, may lead to different solutions. The concept of “affordable”, meaning compatibility of demand and means, is well understood as such everywhere, although its practical application may be much different from place to place. Concrete is a material that lends itself well to affordable housing: it is durable, has good thermal inertia, can be used both as structural and finishing material, and is not sensitive to organic attack. It also has some disadvantages, such as higher cost in developing countries compared to developed countries, and also a potential lack of materials, mainly cement or admixtures. Prefabrication, with its adaptability and quality consciousness, may offer valid, speedy, cost efficient and sustainable solutions. 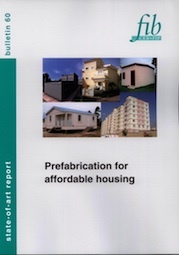 fib Bulletin 60 offers an overview of housing systems as well as information on their features. It shows the main features of a number of construction systems, without entering into the details of the solutions. It aims to make possible a comprehensive comparison, which should help in learning, exchanging and developing ideas on how to better meet the housing needs everywhere, at sustainable cost. A document of this kind was not available before; it is therefore expected to be of great interest and a source of ideas for all those who have to confront similar problems.